The Agrilinks team traveled to Nepal for the Feed the Future Innovation Lab Council Partners Workshop. Agrilinks Knowledge Management Specialist Marisol Pierce-Quinonez, who attended the meeting, created a blog series about the workshop which is available below and in three parts on the Agrilinks website. This day began by diving directly into the weeds, or rather, a discussion of the latest research to come out of Innovation Labs on the topics of crop improvement, nutrition, and horticulture. Richard Rose from International Development Enterprises (iDE) used a nice Venn Diagram of successful interventions having not only the what(the research/tech innovation), but also the who (the audience/those in need) and the how (the market/business model). Overall, there was a basic understanding that if an innovation doesn’t make financial sense to a smallholder farmer, it won’t be adopted. This sentiment was repeated in various ways, and I think people are leaving with an appreciation for thinking of nutrition and food security interventions systemically – from research to on-the-ground implementation. Field trip tomorrow! Stay tuned for updates. The Innovation Lab Annual Workshop concluded on Tuesday after two solid days of presentations from Innovation Lab leaders, Mission Directors, and USAID staff, all on the topic of scaling up agricultural technology and innovations. To see these issues in action, about two-dozen of us piled into a van and disembarked for the Kathmandu airport, where we hopped on a short flight to Nepalgunj, in the Terrai region of Nepal. This region contains some of Nepal’s most productive agricultural land and, as most of the men have emigrated to India or the Middle East for unskilled labor jobs, is largely cultivated by women. 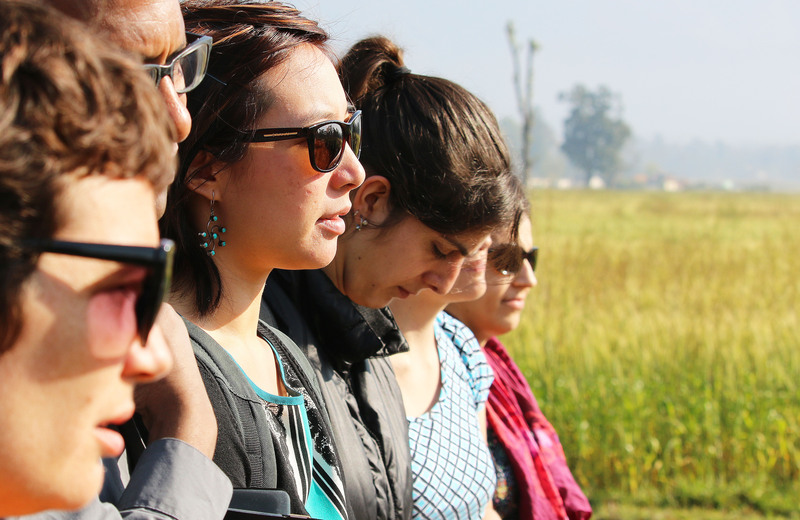 The two-day excursion took us to various sites around the mid-western region of Nepal in support of the Knowledge-based Integrated Agriculture and Nutrition (KISAN) Project. Our first destination showcased an integral component of the KISAN Project—an Integrated Pest Management (IPM) test-site.Virginia Tech’s IPM Innovation Lab develops and disseminates IPM techniques and training for smallholder farmers. Each farmer received a practice plot and was assigned to a group. These groups were organized by a community facilitator to coordinate pesticide and fertilizer purchases and also act as a public relations and community liaison to potential future IPM farmers. Many of the training program participants were on hand to answer questions and told us that they were happy with the results so far (most of the cauliflower, tomatoes, and bitter gourd they grew they were feeding their families, but some were also sold). These women mentioned that before the training, their husbands were using much more harmful pesticides on their fields. Upon completion of the program, the women plan to bring their IPM knowledge back to their home farms. Ever the entomologist R. Muniappan brought out his net and captured a few pests to show what sort of critters attack cauliflower. Next we headed over to a site run by the Cereal System Initiative for South Asia (CSISA). There, we were greeted by a horde of small children, Marigold bouquets, and a smear of red paint on our foreheads. We heard about the small-scale mechanism CSISA was demonstrating to local farmers as a part of the project—tools that could vastly improve yields and reduce the amount of time farmers spent in the field. Although local, small-scale farmers would not be able to purchase these tools outright, CSISA is attempting to build demand for these tools and a service sector to rent them out simultaneously. 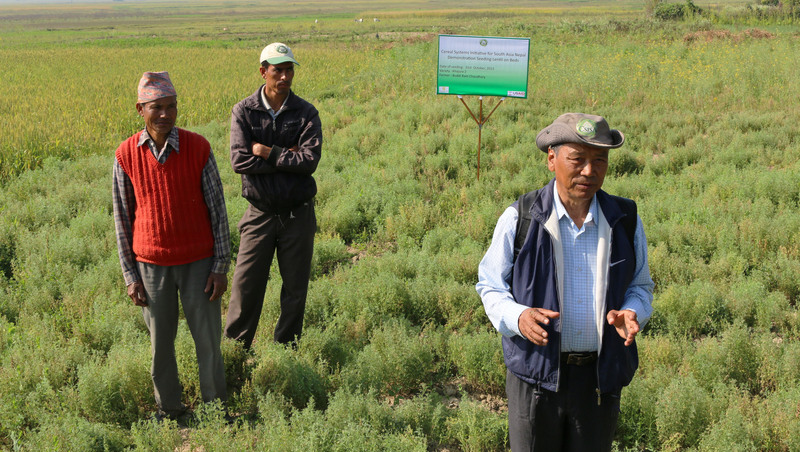 CSISA is also working with Nepal’s Agricultural Research Center to find lentil seeds that are most suitable for Nepal. Currently, many farmers are using seed varieties that are 30 or 40 years old, even though many improvements have been made since then. CSISA Scientist presenting the trial lentil plot with farmers. From here, I rode in the back of a pickup truck to our third site, a test-plot in which International Development Enterprises (iDE) is training local women to grow cucumbers instead of wheat. The test-plot consisted of 36 low-tunnels surrounded by field after field of wheat, and the women told us how the tunnels had increased their earning potential by allowing them to bring cucumbers much earlier to market than others (and fetch a higher price). The women were excited by the increased earning potential over the much lower returns of wheat farming, and said that their husbands were taking notice and may reconsider emigrating to India for temporary work next season. According to staff on the ground, iDE are “the scale guys.” They’ve found a high-value crop with a reliable market and are working with the IPM Innovation Lab, Nepal Agricultural Research Council (NARC), and Winrock International to bring it to scale. The women’s enthusiasm at this site resonated with our group, and it is easy to imagine the impact iDE’s 300 additional demo plots is having on their 24,000 demo-plot farmers throughout Nepal. 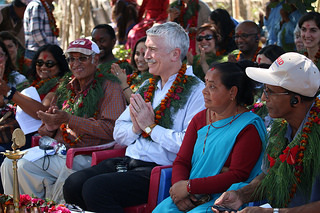 USAID Bureau for Food Security’s Robert Bertram and crew being welcomed by village. After lunch, we headed over to a Heifer International project to learn how they go about integrating nutrition into their agricultural projects. As the bus pulled into the village, we noticed quite a commotion amongst the villagers and spent a few harried moments debating who would act as “Chief Guest.” Eventually, we designated Rob Bertram of USAID/BFS as our representative as we disembarked to a receiving line of women, took a seat under a few large trees, and looked out over a sea of teal and aquamarine saris. Even before Heifer donates any animals, the entire community comes together to learn about animal husbandry, nutrition, foraging for animal feed, and kitchen gardening. Once the training is complete, they elect the first recipients. These women receive a goat, water buffalo, or cow and are responsible for the “passing of the gift” of the first-born female animal to the next designated family. What struck me most throughout the day was the power of agricultural training and education as a force for community-building. The women’s groups that we spoke to were all highly organized and had empowered themselves to speak on each other’s behalf and collectively organize their will. Numerous residents of Mahadevpuri said again and again how the trainings had brought the community together and given them hope for their collective future. As one Nepali woman so eloquently stated, the trainings helped them realize that “lots of small changes eventually build up to big ones.” One can only hope that scaling up all these small agricultural changes will lead to a healthier, better-fed community and a more economically prosperous and resilient Nepal. 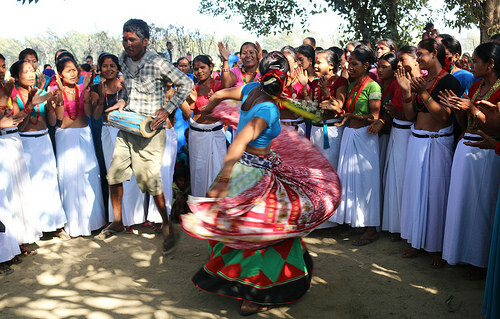 Village members performing for guests.